Have any of you gone to any St. Patty day parades over the weekend? Do you celebrate this holiday? If so, what do you do? I'd love to hear from you in the comments below!! This past week has been rough for me. I have been extremely ill and not feeling all too well. Doing my best to recover and get my energy back up there. Still struggling with a cold too. Okay so before I get to today's question, I would really love to say THANK YOU to three of my sweet and loyal blog readers...Dorothy, Margaret & Lillian! These three ladies have sent me some gorgeous cards and boy did they put a huge smile on my face! Thank you ladies so much. It really made my week!!! I wish I could have posted pictures of the cards they sent because they are gorgeous but my I was not feeling well and in bed most of the weekend. I will try to post pics next week! Again, thank you ladies!! Today's question comes from Marisol V. who wants to know, " Do you use social media sites and if you do use them do you use them as a way to display your projects?" Well I appreciate your writing in Marisol and great question too! I hope to hear from you again soon!!!! Before I go, I wanted to share a little St. Patrick's day treat with you all that I think you and the family would enjoy. 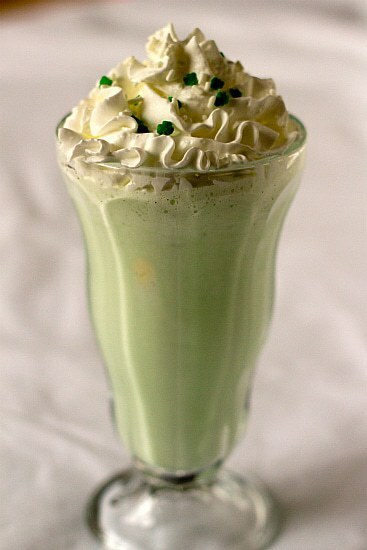 A delicious mint Shamrock Shake! Combine all ingredients in a blender until smooth and blended. Divide between two glasses, top with whipped cream and enjoy! Happy St. Patrick's Day. We celebrate by eating corn beef & cabbage and stuffed cabbage rolls on St. Patrick's Day. The kitchen smell is something that some people do not like but it is all very tasty. Thank you for the milk shake recipe. I'll make it for dessert today. I agree with you on the social media issue. I use social media to post sometimes on Facebook and do not have a Twitter account. I get notices alot from Linked to add someone as a friend but choose to not use that site anymore. My daughter likes tumbler (not sure if I spelled it correctly) to watch videos & uses Facebook to connect with friends via chat but she does not post much. We do not have our phones or other electronic devices at dinner time. Melissa.... I am so sorry that you are having issues leaving comments on the blog. I would really suggest that you look into contacting blogger to resolve this. As for your post, I am so happy that you shared your family tradition for St. Patty's day! I am not a fan of cabbage but I know that the rest of my family would LOVE your cabbage rolls. Sounds like you'll give the Shamrock shake a try! Let me know if you like it! And good for you that you don't do social media as much either. I think people go overboard with it and forget that family time is precious and goes by so fast and every minute they waste on social media is another minute of missed quality time with loved ones. Have a wonderful day! Trying to see if this reply shows up. Have contacted blogger & yahoo and neither was of much help. I get a DMAC Domain something error and they do not seem to know why. Don't really celebrate St Patrick's Day. So many people use social media but I just don't have time to keep up with it. My projects post to FB and I have a few DT groups that I keep up with, otherwise I just don't use it. Forget twitter and instagram!! I hope you are feeling much better my friend. Sending St. Patty's Day hugs!! yummy shake! I hope you enjoyed it and get better real soon! I am sorry you have been so ill and I hope you are feeling better soon. I am glad you received my card and you liked it. I used an Art by Miran digi stamp and put it on my blog here- http://granmargaret.blogspot.com.au/2015/03/art-by-miran-challenge-26-anything-goes.html (on 1 March) You can copy it from my blog to save you having to photograph it or scan it. As for St Patricks day, they do have a big parade in Sydney but I am not well enough to go into the city now. My eldest daughter Lynda's daughter Sian (my third grand daughter) goes to St Patricks college so they had St Patricks day mass at her school. I made St Patricks day cards and sent to Lynda and Sian. Lynda had to go to work. She sprained her ankle so she is now off work for the week. Had a good St. Patrick's Day meal. Liked the shake. I'm testing whether this comment appears or not by logging into gmail account. I was trying to change the email of my blog but it will only allow me to edit the alternate email address which is my yahoo and when I comment on 2 blogs one of which is yours I get an error sent to my yahoo email. Only thing I could find of any help was that it indicated to be logged into the email from which I'm making the comment so here goes.